1/2 LB burgers seasoned and garnished with lettuce, pickle chips, onion, and upon request tomato. ****Also served as a wrap. 8oz. 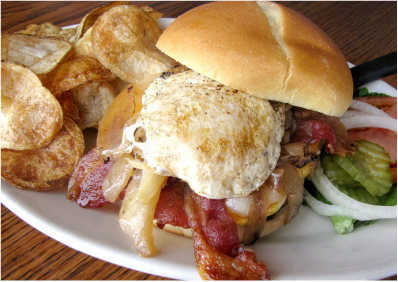 burger with American, Swiss and Cheddar cheese, smoked bacon, grilled onions, and a fried egg. Pepper Cheese, hickory smoked bacon, pickled jalapenos, onion straws, lettuce, tomato, finished with a sweet and spicy sauce on a toasted garlic kaiser bun. Cheddar cheese, hickory smoked bacon, smothered with BBQ sauce topped with onion straws. Swiss cheese, sauteed mushrooms, grilled onions smothered with a horseradish sauce. Grilled chicken tossed in hot sauce topped with provolone cheese and a side of ranch. Sliced turkey, ham and bacon piled high on toasted sourdough with Swiss cheese, lettuce, tomato, and mayonnaise. Fried Pork Tenderloin topped with white onion, pickles, and a mustard mayo comb served on a Kaiser bun. Hickory smoked wood bacon piled high with lettuce, tomato, mayonnaise served on toasted sourdough. Grilled sourdough with melted American, Swiss, and provolone cheese. Thinly sliced ribeye steak seared with grilled onions, red peppers, and provolone cheese served on a hoagie. Grilled chicken topped with pepper cheese, hickory smoked bacon, lettuce,tomato, red onion smothered with a spicy bbq sauce served on a kaiser roll. Blackened chicken topped with tomato Romaine lettuce tossed in Caesar dressing. Grilled chicken served on a garlic hoagie bun, smothered with chipotle sauce and topped with melted provolone with lettuce, tomato, and red onion. Seasoned pork loin seared topped with grilled ham, Swiss cheese, pickles, yellow mustard served on a toasted hoagie. Thinly sliced Pastrami topped with Swiss cheese, coleslaw,finished with yellow mustard served on toasted marble rye. Cottage Cheese, Coleslaw, Housemade Pub Chips, Tortilla Chips.